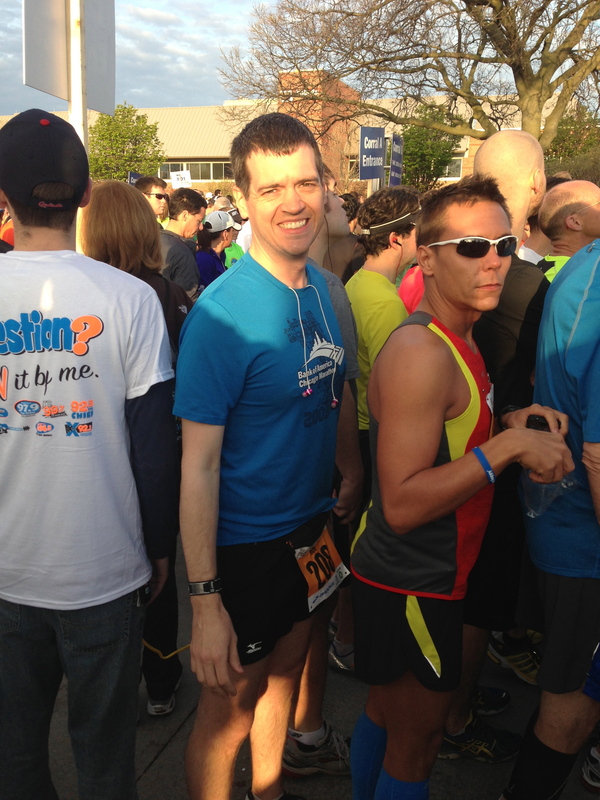 This weekend was the IL Marathon events in Champaign, IL. This event has evolved and improved over the years. Over the years the IL Marathon has added a 5K option on Friday night. 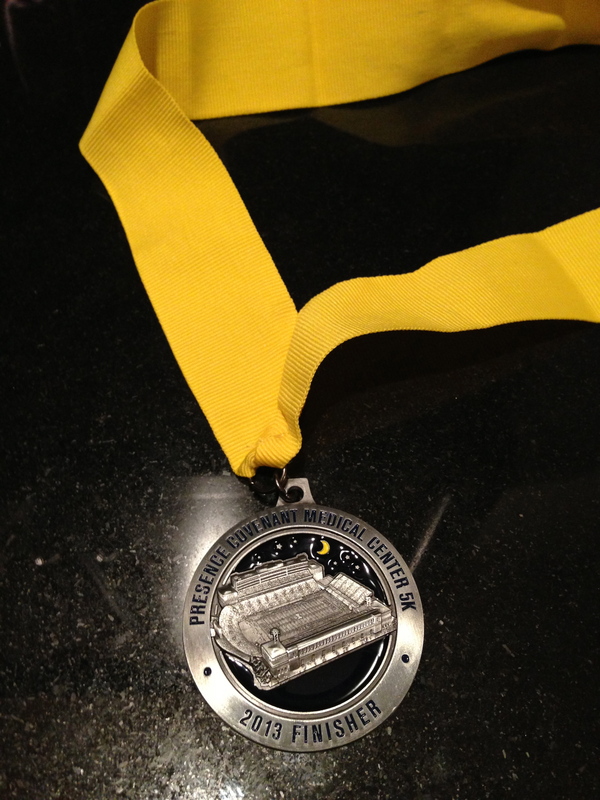 If you complete the 5K and then one of the other races Saturday (10K, Half Marathon, Full Marathon) you get either a Mini-I Challenge, Half I-Challenge, or Full I-Challenge medal as well. This year being 8.5 months pregnant I would be tentatively participating by walking the 5K and 10K if I was feeling up to it. Last year we ran the 5K at an easy pace before our marathons. This time Rob would be walking with me. The 5K has 6,000 participants and is very crowded. It’s a relaxed environment and it appears that running strollers may be allowed to (always check first though). It’s a great way to get into running if you haven’t raced a 5K before because it’s a casual environment. If you are a seasoned racer, just expect for this to be more about a casual pre-event to Saturday. The 5K started at 7:30pm and I wish I would have brought my jelly ring that has lights in it. This would be a good race to bust out any glow necklaces, etc. Rob and I walked with a little running mixed in. 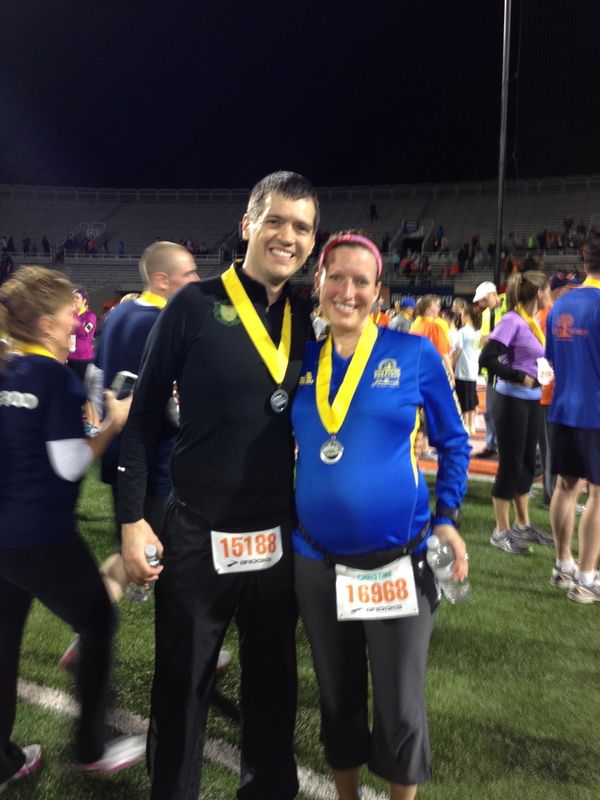 It was awesome to have so many people cheering “Go pregnant lady!” and “Go Mama!”. 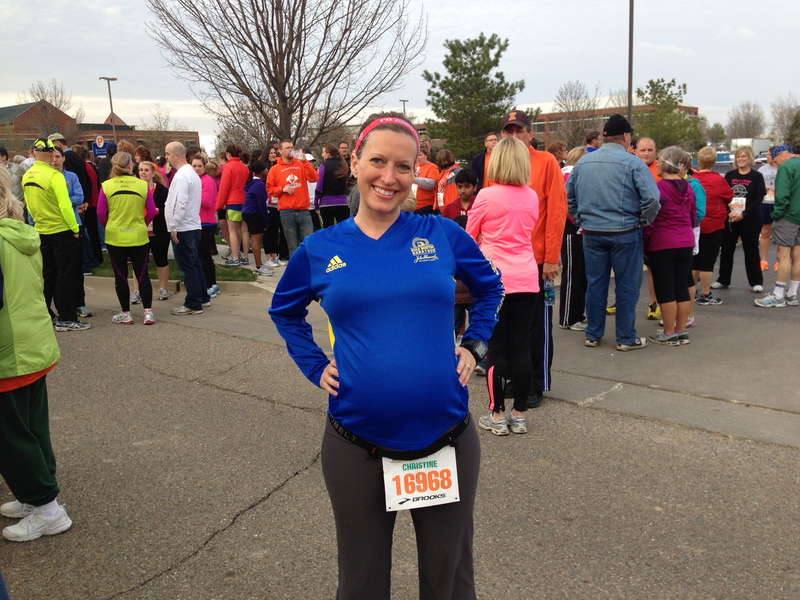 I have to say being pregnant and staying active has really changed my outlook on running. I used to focus more on my running times and the race aspect of it all. Being forced to slow down has allowed me to enjoy the environment and appreciate the running community in a way I hadn’t before. Seeing so many different people: ages, weight, health conditions toughing it out. I always enjoyed seeing people out working hard, but now I was witnessing it mid-race and it is awesome! I said to Rob, “this confirms for me there will NEVER be an excuse or reason to not be out running a race”. Okay the only reason would be a doctor saying ‘no’, but that would be the only reason. The people around us were doing it and it reaffirmed for me that this is something I want to do forever. We finished in 44:22 (14:17 pace). Saturday morning was perfect race weather: low 50s, no wind (later it got up to 8mph), a little overcast. We were up at 3:30am and got on the road about 4:30am. We were parked and settled before 5:30am and got to catch up with some of our friends that were also running. Rob in corral A. The marathon and half marathon started at 7:00am with the 10K starting at 7:40am. I was expecting to need to stop a few times for the bathroom, but actually I felt fine and made it the whole way without any pit stops. The funniest thing that happened on our walk was that about .5 mile to the finish. This older lady in the run/walk lit up a cigarette and was smoking while walking! We couldn’t believe it! Then she started to pick up her pace and I was like “oh hell no, we have to pass this lady”. So we picked up our pace and ran into the finish to get away from this lady and also because it’s fun to run into the finish of Memorial Stadium on the 50 yard line. 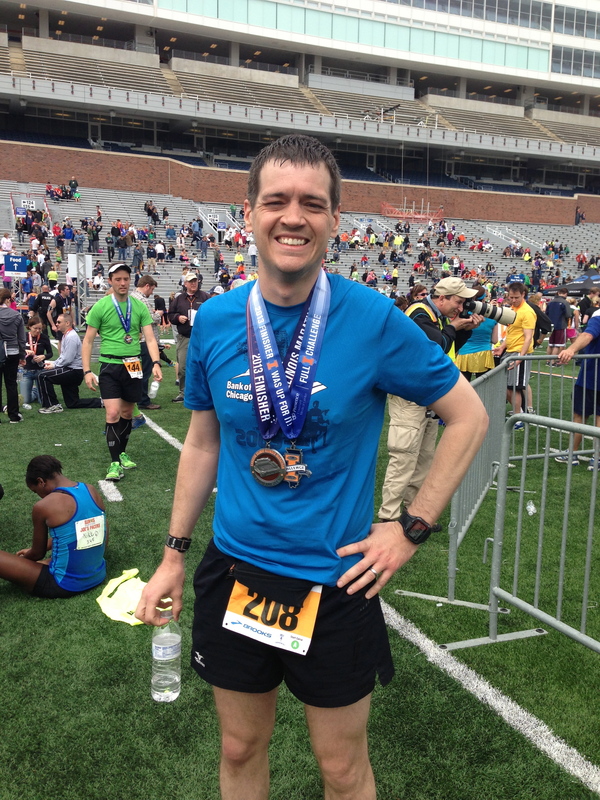 All done 1:44:05 (16:45 pace). 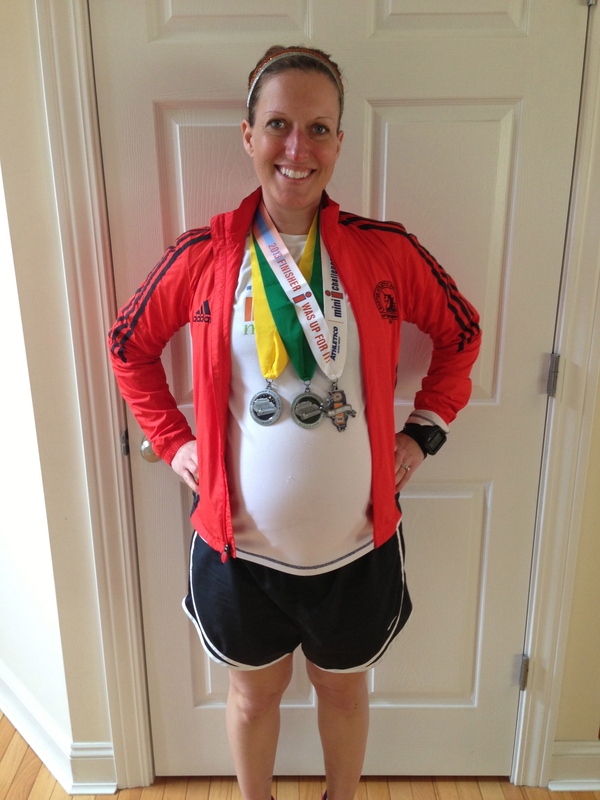 Me with my 10K medal and Mini-I Challenge medal. Rob texted me while running the marathon, which I immediately knew if he is texting, it’s not going well for him. He had leg cramping earlier into the race and was just toughing it out to finish. He finished in 4:07:38 (9:27 pace) and got his 11th marathon completed. Rob with his Full Marathon medal and Full I-Challenge medal. 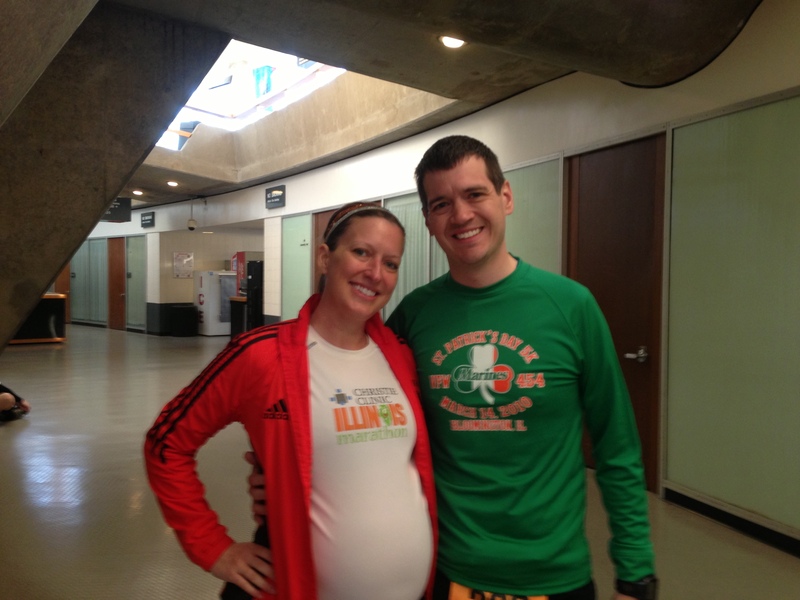 A successful IL Marathon weekend for us. We got out there and are keeping active! 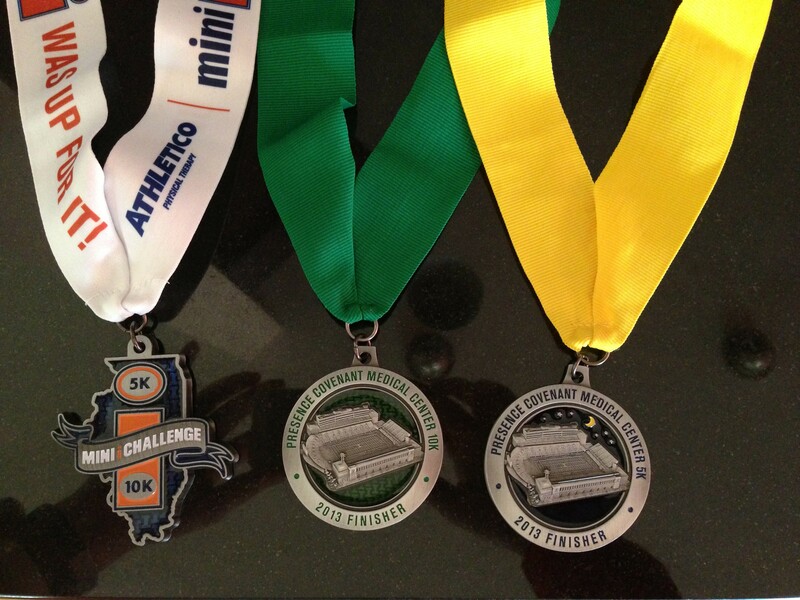 2013 IL Marathon Mini-I Challenge, 10K, and 5K medals. 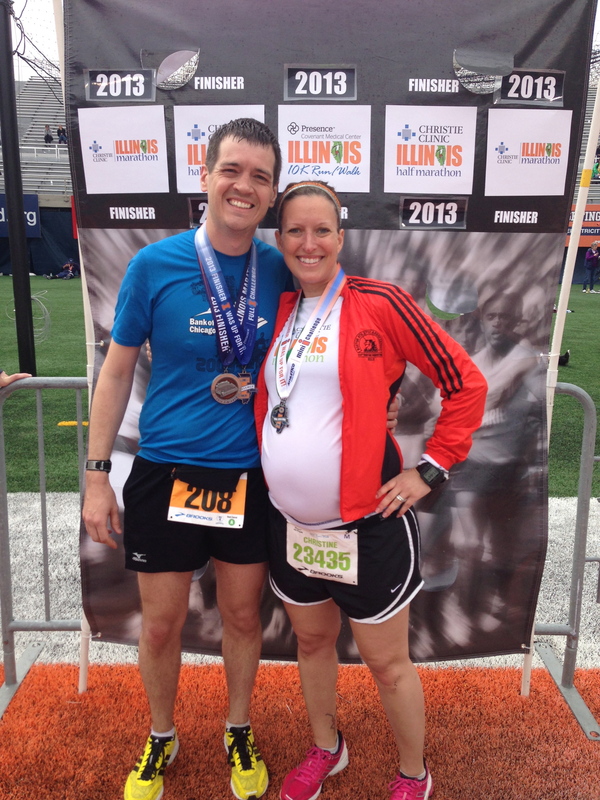 We all hope that those of you that were out at the IL Marathon weekend had a great time! YOU are adorable. 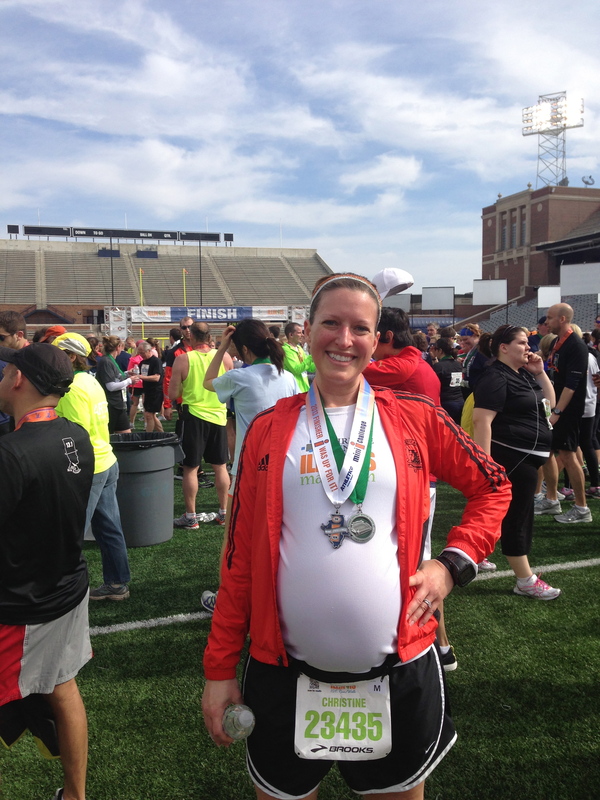 I am so impressed with your attitude and dedication to exercise throughout your pregnancy. I think you are an excellent role model for other expecting mothers. You’ve had a very healthy balance of appropriate exercise. So does this mean you have only a few weeks left???? That is SO exciting!!!!! Thanks Rebecca! And congratulations on your engagement! I’m so happy for you! 😀 We only have 6 weeks to go! Thanks Kim! 🙂 I’m happy to still be able to move as much as possible. Thanks Curt! 🙂 Congrats on IL Half! Was also down there! Congrats on the accomplishment. I’m impressed by any almost having a baby lady soon these events! Weren’t the college frat parties cheering us on just amazing on Friday night? You look great. 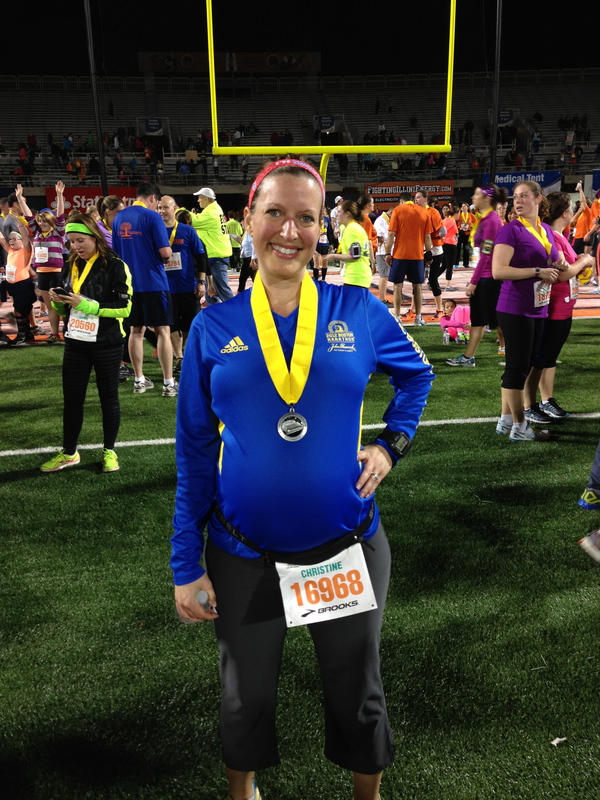 Congrats on completing the 5 & 10K! Thanks Steph! And congrats on your Boston and your BQ!! You are seriously so awesome. I think I’ll tell you that in 99.99% of all the blogs I comment on. Good luck during your last few weeks and cannot wait to hear about the baby!